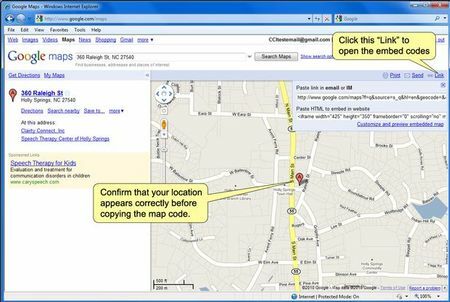 Using the map code function is quite easy and allows your customers to have a easier time locating your office, property or event. 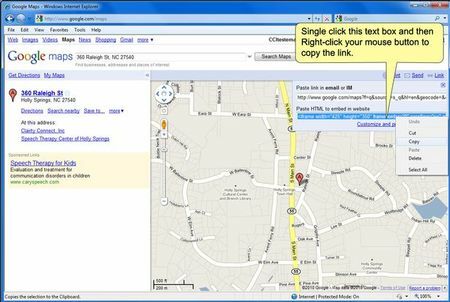 For demonstration purposes, using Google Maps, www.maps.google.com, (our tools support any map that supplies a link). Enter your address and click 'Search Map'. Verify your location is correct and the click on the 'Link' button (looks like a chain) at the top right to retrireve your map code. 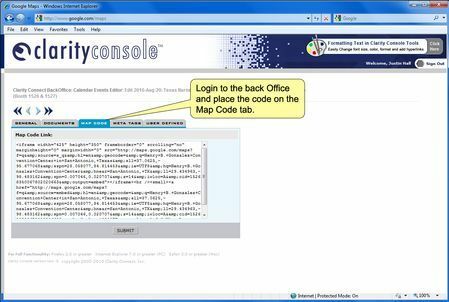 Copy the code that says paste HTML to embed in website (different versions might have different wording but find the one that says for use with HTML code) from the box (Figure 3) and paste it into the 'Map Code Link' box on the MAP CODE tab of your Calendar of Events Editor record. Once it's pasted click Submit. Note: Sometimes you need to click on Submit twice. 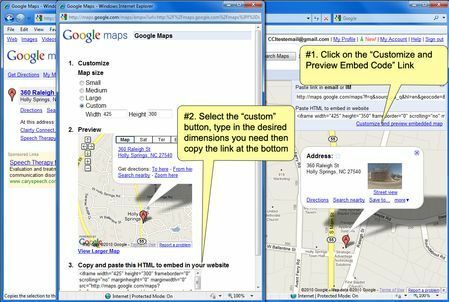 If you don't like the size of the map, you can go back to Google Maps and click on the Customize and Preview Embedded Map text link and then click on the ( ) Custom option to change the pixel height and/or width. The new map size will be displayed and the corresponding code will be updated and display in a box below the map. When you are happy with the size, copy and paste the new code into the 'Map Code Link' box on the MAP CODE tab of your Calendar of Events Editor record.